AguaVert is a patented water treatment system, primarily designed for medium tolarge scale water purification system needs. 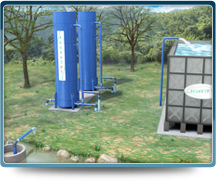 AguaVert produces 650 gallons to millions of gallons per hour of clarified water. As either a manually operated or automated system, AguaVert can meet your water purification needs. The filtration system is innovative, in that it provides a cost effective, fast build-out and modular scalability for water purification. Whether it be for, potable water purification, wastewater recycling, cooling tower bypass filtration, AguaVert can meet a number of filtration needs. There are mobile trailer treatment system options available. Where the system can be used for disaster recovery water purification or military mobile water treatment. AguaVert is a modular system that can be scaled in either a series or parallel simply by adding units. 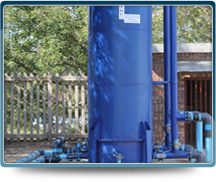 In addition to the ability to scale, various filter sizes are available to meet your capacity requirements. In contrast to traditional large volume sand filtration systems, AguaVert provides customers the opportunity to easily expand capacity by adding filtration units. For example, once a customer has installed their first unit they can add more units based on future demand. AguaVert provides clean water to nearly 1 million people and has been installing purification plants since 2006.